Manila Bay, strategically located around the capital city of the Philippines, is a popular attraction with its spectacular view of the sunset. Near it is the SM Mall of Asia which is also a tourist destination especially for those who love shopping and eating. There are lots of hotels to choose from in this area, but not all of them are great places to stay! #1 - Sofitel Philippine Plaza Manila: Indulge in the luxurious experience that this 5-star resort hotel could offer. Choose from all 609 rooms in which some has private balconies and views of the Manila Bay. Enjoy the lagoon-style pool, retreat to the spa, or treat your taste buds with the sumptuous buffets that they offer. Shuttle trip to and from SM Mall of Asia is also available. #2 - Conrad Manila: Situated right beside the Manila Bay, this hotel designed like an anchored ship, is more than just its structural visuals. They offer guests superior services ensuring a comfortable stay. Established on 2016, all of its 347 rooms among the other facilities, are equipped with modern luxurious features. It also has direct walkways to SM Mall of Asia and in just a few steps, you are already at the mall. #3 - Solaire Resort & Casino: Be welcomed by the panoramic view of the Manila Bay in this urban resort hotel favored by most gamers and high rollers. It has two 17-storey towers—Sky Tower and Bay Tower—with combined 800 rooms, suites, and bayside villas which have their own swimming pool and deck overlooking the Manila Bay. Moreover, trips to SM Mall of Asia is very convenient as they have exclusive complimentary transport for guests to and from Solaire every 15 minutes. #4 - Microtel Inn & Suites by Wyndham Manila: Microtel is a 3-star city hotel that features some rooms that have a great view of the Manila Bay and the MOA Eye Ferris Wheel. Its facilities include a rooftop pool and a fitness center. It is very accessible to SM Mall of Asia but they also offer free scheduled shuttle service for more convenience. #5 - Hotel 101 Manila: One of the most affordable hotels in the area, Hotel 101 does not compromise quality over price as they offer services and facilities that address each and every need of their guests. 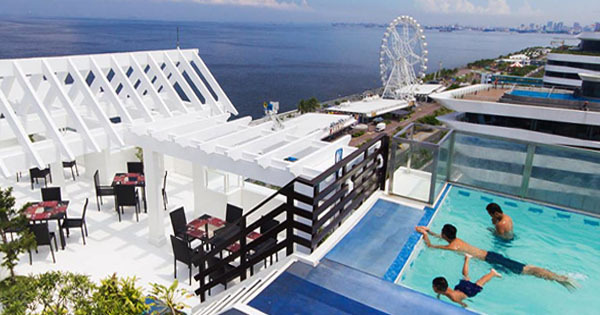 Additionally, the second floor of the hotel has an outdoor swimming pool that displays the Manila Bay sunset. Not to mention its proximity to SM Mall of Asia which is just 700 meters away from the hotel.